I love putting little notes on my holiday gift packages but sometimes I need more room than a regular tag provides. This cute little card using our Deck The Halls Stampin Up Fabric is great; I can get 8 out of one sheet of 12 x 12 card stock. 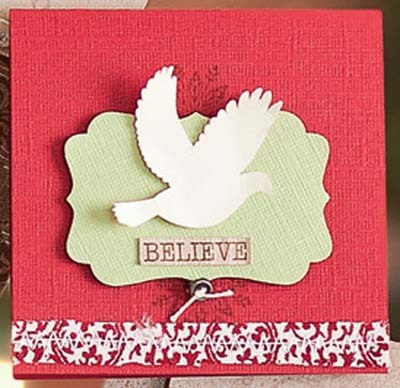 The Peaceful Season Stamp Set used here is one of the free sets I received this past year at our annual Convention. Stamp snowflake images in Cherry Cobbler ink on Cherry Cobbler card. Using zigzag stitch, sew Deck the Halls Designer Fabric to card. Punch out label from Pear Pizzazz Textured Card Stock using Decorative Label Punch. Adhere label to card using Stampin' Dimensionals. Stamp dove in VersaMark ink on Very Vanilla Card Stock. Cut out, and adhere to label using Stampin' Dimensionals. Color "Believe" portion of Jolly Jingles Stampin' Around Jumbo Wheel using Early Espresso Stampin' Write Marker, and stamp on Crumb Cake Card Stock. Cut out, and adhere to card. Tie crochet thread through Vintage Trinket button, and adhere to card. Free products are only one of the great benefits I get as a Stampin' Up! Demonstrator. This is the perfect time of the year to start your own business. To find out more, CLICK HERE. Create a Custom Tee – Vintage Style!